PCBs and chlorinated pesticides in fishes of Virginia waters. Luellen, D.R., G.G. Vadas, M.A. Unger. Kepone in James River fish: 1976-2002. 2006. Sci Total Environ, 358, 286-297. Luellen, D.R. and D. Shea. 2003. Semipermeable membrane devices accumulate conserved ratios of sterane and hopane petroleum biomarkers. Chemosphere, 53, 705-713. Luellen, D.R. and D. Shea. 2002. Calibration and field verification of semipermeable membrane devices for polycyclic aromatic hydrocarbons in water. Environ. Sci. Technol., 36 (8), 1791 -1797. Luellen, D.R. 2009. Shenandoah River Basin Fish Kills: Refinement of a Chemical Contaminant Profile. Report to Virginia Department of Environmental Quality. Luellen D.R., Vadas G.G., Unger M.A. Kepone in James River fish: 1976-2002. SETAC 26th annual meeting, November 2005. Luellen,D.R. Uptake of polycyclic aromatic hydrocarbons into an iso-octane filled variant of the semipermeable membrane device. SETAC 24th annual meeting, November 2003. Organochlorine Contamination on National Wildlife Refuges in the Lower Mississippi River Ecosystem. Shea, D., Hofelt, C.S., Luellen, D.R., N.C. State University, Raleigh, NC; Kelly, J.R., US EPA, Duluth, MN. 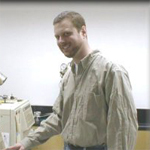 SETAC 17th Annual Meeting, November 1998. Accumulation of PAHs and Hopane/Sterane Biomarkers in Fish and SPMDs as a Means of Discriminating and Apportioning Petroleum Sources. Luellen, D.R. and Shea, D. N.C. State University, Raleigh. SETAC 17th Annual Meeting, November 1998. The Use of Molecular Fossils and Polycyclic Aromatic Hydrocarbons for Source Discrimination of Petroleum Contamination on National Wildlife Refuges. Luellen, D.R. and Shea, D. N.C. State University, Raleigh. NCSU Graduate Student Research Symposium, March 27-28, 1998. Source Discrimination of Hydrocarbon Contamination on National Wildlife Refuges. Luellen, D.R. and Shea, D. N.C. State University, Raleigh. Carolina SETAC Annual Meeting, 1998. Multimedia Fate Model of Organic Contaminants in Massachusetts Bay. Burroughs Wellcome Symposium, Luellen, D.R. and Shea, D. N.C. State University, Raleigh. March 15, 1997. Shea, D.,C.S. Hofelt , D.R. Luellen, A. Huysman, P.R Lazaro, R. Zarzecki, J.R. Kelly. Chemical contamination at national wildlife refuges in the lower Mississippi River ecosystem. Report to US Fish and Wildlife Service, Region IV, Atlanta, GA. 2001. Shea, D., J.R. Kelly, D.R. Luellen, C.S. Hofelt, A. Huysman, P.R Lazaro, R. Zarzecki. Chemical contamination at the Atchafalaya national wildlife refuge. Report to US Fish and Wildlife Service, Region IV, Atlanta, GA. 2000. Shea, D., J.R. Kelly, D.R. Luellen, C.S. Hofelt, A. Huysman, P.R Lazaro, R. Zarzecki. Chemical contamination at the Bayou Cocodrie national wildlife refuge. Report to US Fish and Wildlife Service, Region IV, Atlanta, GA. 2000. Shea, D., J.R. Kelly, D.R. Luellen, C.S. Hofelt, A. Huysman, P.R Lazaro, R. Zarzecki. Chemical contamination at the Bald Knob national wildlife refuge. Report to US Fish and Wildlife Service, Region IV, Atlanta, GA. 2000. Shea, D., J.R. Kelly, D.R. Luellen, C.S. Hofelt, A. Huysman, P.R Lazaro, R. Zarzecki. Chemical contamination at the Big Lake national wildlife refuge. Report to US Fish and Wildlife Service, Region IV, Atlanta, GA. 2000. Shea, D., J.R. Kelly, D.R. Luellen, C.S. Hofelt, A. Huysman, P.R Lazaro, R. Zarzecki. Chemical contamination at the Chickasaw national wildlife refuge. Report to US Fish and Wildlife Service, Region IV, Atlanta, GA. 2000. Shea, D., J.R. Kelly, D.R. Luellen, C.S. Hofelt, A. Huysman, P.R Lazaro, R. Zarzecki. Chemical contamination at the Cache River national wildlife refuge. Report to US Fish and Wildlife Service, Region IV, Atlanta, GA. 2000. Shea, D., J.R. Kelly, D.R. Luellen, C.S. Hofelt, A. Huysman, P.R Lazaro, R. Zarzecki. Chemical contamination at the Catahoula national wildlife refuge. Report to US Fish and Wildlife Service, Region IV, Atlanta, GA. 2000. Shea, D., J.R. Kelly, D.R. Luellen, C.S. Hofelt, A. Huysman, P.R Lazaro, R. Zarzecki. Chemical contamination at the Dahomey national wildlife refuge. Report to US Fish and Wildlife Service, Region IV, Atlanta, GA. 2000. Shea, D., J.R. Kelly, D.R. Luellen, C.S. Hofelt, A. Huysman, P.R Lazaro, R. Zarzecki. Chemical contamination at the Delta national wildlife refuge. Report to US Fish and Wildlife Service, Region IV, Atlanta, GA. 2000. Shea, D., J.R. Kelly, D.R. Luellen, C.S. Hofelt, A. Huysman, P.R Lazaro, R. Zarzecki. Chemical contamination at the Grand Cote national wildlife refuge. Report to US Fish and Wildlife Service, Region IV, Atlanta, GA. 2000. Shea, D., J.R. Kelly, D.R. Luellen, C.S. Hofelt, A. Huysman, P.R Lazaro, R. Zarzecki. Chemical contamination at the Handy Brake national wildlife refuge. Report to US Fish and Wildlife Service, Region IV, Atlanta, GA. 2000. Shea, D., J.R. Kelly, D.R. Luellen, C.S. Hofelt, A. Huysman, P.R Lazaro, R. Zarzecki. Chemical contamination at the Hillside national wildlife refuge. Report to US Fish and Wildlife Service, Region IV, Atlanta, GA. 2000. Shea, D., J.R. Kelly, D.R. Luellen, C.S. Hofelt, A. Huysman, P.R Lazaro, R. Zarzecki. Chemical contamination at the Lower Hatchie national wildlife refuge. Report to US Fish and Wildlife Service, Region IV, Atlanta, GA. 2000. Shea, D., J.R. Kelly, D.R. Luellen, C.S. Hofelt, A. Huysman, P.R Lazaro, R. Zarzecki. Chemical contamination at the Lake Isom national wildlife refuge. Report to US Fish and Wildlife Service, Region IV, Atlanta, GA. 2000. Shea, D., J.R. Kelly, D.R. Luellen, C.S. Hofelt, A. Huysman, P.R Lazaro, R. Zarzecki. Chemical contamination at the Lake Ophelia national wildlife refuge. Report to US Fish and Wildlife Service, Region IV, Atlanta, GA. 2000. Shea, D., J.R. Kelly, D.R. Luellen, C.S. Hofelt, A. Huysman, P.R Lazaro, R. Zarzecki. Chemical contamination at the Mathews Brake national wildlife refuge. Report to US Fish and Wildlife Service, Region IV, Atlanta, GA. 2000. Shea, D., J.R. Kelly, D.R. Luellen, C.S. Hofelt, A. Huysman, P.R Lazaro, R. Zarzecki. Chemical contamination at the Morgan Brake national wildlife refuge. Report to US Fish and Wildlife Service, Region IV, Atlanta, GA. 2000. Shea, D., J.R. Kelly, D.R. Luellen, C.S. Hofelt, A. Huysman, P.R Lazaro, R. Zarzecki. Chemical contamination at the Overflow national wildlife refuge. Report to US Fish and Wildlife Service, Region IV, Atlanta, GA. 2000. Shea, D., J.R. Kelly, D.R. Luellen, C.S. Hofelt, A. Huysman, P.R Lazaro, R. Zarzecki. Chemical contamination at the Panther Swamp national wildlife refuge. Report to US Fish and Wildlife Service, Region IV, Atlanta, GA. 2000. Shea, D., J.R. Kelly, D.R. Luellen, C.S. Hofelt, A. Huysman, P.R Lazaro, R. Zarzecki. Chemical contamination at the Reelfoot national wildlife refuge. Report to US Fish and Wildlife Service, Region IV, Atlanta, GA. 2000. Shea, D., J.R. Kelly, D.R. Luellen, C.S. Hofelt, A. Huysman, P.R Lazaro, R. Zarzecki. Chemical contamination at the Saint Catherine Creek national wildlife refuge. Report to US Fish and Wildlife Service, Region IV, Atlanta, GA. 2000. Shea, D., J.R. Kelly, D.R. Luellen, C.S. Hofelt, A. Huysman, P.R Lazaro, R. Zarzecki. Chemical contamination at the Tallahatchie national wildlife refuge. Report to US Fish and Wildlife Service, Region IV, Atlanta, GA. 2000. Shea, D., J.R. Kelly, D.R. Luellen, C.S. Hofelt, A. Huysman, P.R Lazaro, R. Zarzecki. Chemical contamination at the Tensas River national wildlife refuge. Report to US Fish and Wildlife Service, Region IV, Atlanta, GA. 2000. Shea, D., J.R. Kelly, D.R. Luellen, C.S. Hofelt, A. Huysman, P.R Lazaro, R. Zarzecki. Chemical contamination at the Wapanocca national wildlife refuge. Report to US Fish and Wildlife Service, Region IV, Atlanta, GA. 2000. Shea, D., J.R. Kelly, D.R. Luellen, C.S. Hofelt, A. Huysman, P.R Lazaro, R. Zarzecki. Chemical contamination at the White River national wildlife refuge. Report to US Fish and Wildlife Service, Region IV, Atlanta, GA. 2000. Shea, D., J.R. Kelly, D.R. Luellen, C.S. Hofelt, A. Huysman, P.R Lazaro, R. Zarzecki. Chemical contamination at the Yazoo national wildlife refuge. Report to US Fish and Wildlife Service, Region IV, Atlanta, GA. 2000.